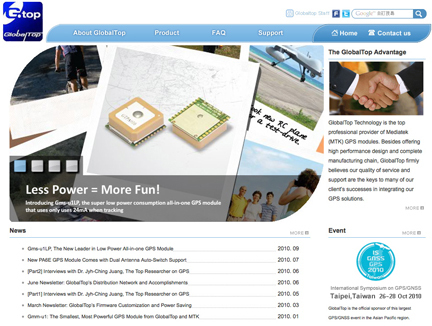 [SatNews] GlobalTop Technology Inc. has announced its all-in-one GPS module featuring incredibly low power consumption (24 mA @ Tracking / 30 mA @ Acquisition), support for dual antenna with antenna auto switching and shortage protection, while maintaining high level of reception sensitivity. The GlobalTop Gms-u1LP is an all-in-one, high sensitivity, low power consumption, small SMD form factor (16 x 16 x 6 mm) GPS antenna module. It uses the MediaTek GPS MT3329 solution that supports as many as 66 channels of satellite searching with 165dBm sensitivity and 10Hz maximum update rate for precise GPS signal processing under low receptive, high velocity conditions. Gms-u1LP comes with the addition of a power saving switching mode power supply (SMPS) that can help reduces the overall GPS power consumption by over 30 percent when compared to the previous generation of the popular GlobalTop PA6 family. With a minuscule 24mA of power consumption, Gms-u1LP is perfect for mobile devices such as digital camera, personal trackers, and personal location beacon (PLBs), where power conservation is crucial. In addition to dedicated technical staffs for GPS integration support and customization, GlobalTop also works closely with MTK on designing innovative GPS features, and is currently one of the largest MTK GPS solution providers. Gms-u1LP is available for samples and volume production now.